The song is filmed on Aparna Sen and Jitendra. As it was the norm for a song sequence during the late1960s and early 1970s, while romancing his heroine, Jitendra hinders Aparna Sen's vision by standing in front of her in the convertible jeep while she is driving (worse than texting while driving) and hangs on the side of the moving vehicle, throwing caution to the wind and then takes her for an elephant ride without the Mahaut's supervision. Aparna Sen is a critically acclaimed film maker, script writer and actress, whose other notable role in Hindi films was in "Sagina" with Dilip Kumar and Saira Banu. Jitendra started his screen career as Sandhya's double in "Navrang". Since then he went on to play a wide variety of roles ranging from youthful, acrobatic Gopal in "Farz" to the teacher in "Parichay" (which was inspired by "Sound of music"). He almost got married to Hema. He has received many "lifetime awards", but none for his lead roles. Jatin Arya for mixing this song. 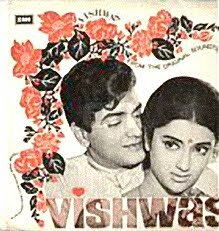 I am also very thankful to Paras Acharya for helping me gather some information for the film Vishwas which has some wonderful songs like "Chandi Ki Deewar Na Todi" and excellent music by Kalyanji-Anandji who received Filmfare award for another song from Vishwas "Aap se hum ko bichhade huve"
Friends, please do listen and leave your valuable feedback. I will greatly appreciate your support! I had dismissed this duet years ago when I first heard it. You made a convert out of me. Dinesh: Liked your emphasis and expressions. Nikita: Liked your voice and expressions. Dineshbhai,the champion of oldies,you always manage to select melodiously haunting songs and the female(Nikita in this song) singer to compliment your voice, rendered flawless by both of yous.The only complaint we don't get more of them sooner,Karim. Superb! It is around 6.15 am here and you have made my day. I have posted the comments at Muziobo too. KUDOS to both of you. Who is this lady singer with you? Is she based in Canada? Congrats once again. I have downloded this number. Dinesh , Nikita - I am hearing this song after a long time !!! Thanks to you. Enjoyed the rendition!! Nice upbeat song! You both sang really nicely. The song is emoted well. Mixing is also good. The treble could have been reduced from the track. Dinesh bhai and Nikita... you guys brought this beautiful oldie today and it was a pleasure listening to your voices here... beautiful singing and chemistry was great as usual... keep rocking like that. Thanks. Lovely romantic duet from the yesteryear. Good rendition by both of you. Dinesh, you emoted well, and any MukeshJi song sounds just perfect in your voice. Watch for those ending notes, which sound little abrupt. Nikita's voice has that young freshness, and sweetness as well. Well done, both of you. I would like to thank each and every one who have been kind for their time listening and feeding comments. I really appreciate your support. Paras, Karim, Dr. Misra, Bharti Azam, Wazif, Bhavna Sonegra and Asim. My special thanks to Nikita and Jatin Arya who made this happen. Thank you so much Chiman & Aruna for your support and encouragement. What a gr8 attempt..amazing.....u sung this really very gud...my favourite song of Mukeshji..and Nikita has sung this very well too...same,Jats Mixed this so beautifully...Best wishesh to all..gr8 Job..Salute.. aapno khub abhaar. Thanks for your encouragement and kind words. I am glad you liked our attempt. That was very sweet of you. I am very happy that you enjoyed. We do need your encouragement and support. Thanks! Dear Dineshbhaai & Nikita, heartiest Congrats ..! !